Novo Ladizhichi, Ukraine, is a new village, built by the Soviet government in 1987 for evacuees from the original Ladizhichi. The church has been under construction for over a decade, as villagers have had trouble raising enough money to continue. Because it is unfinished, the church is decorated with temporary posters rather than murals. 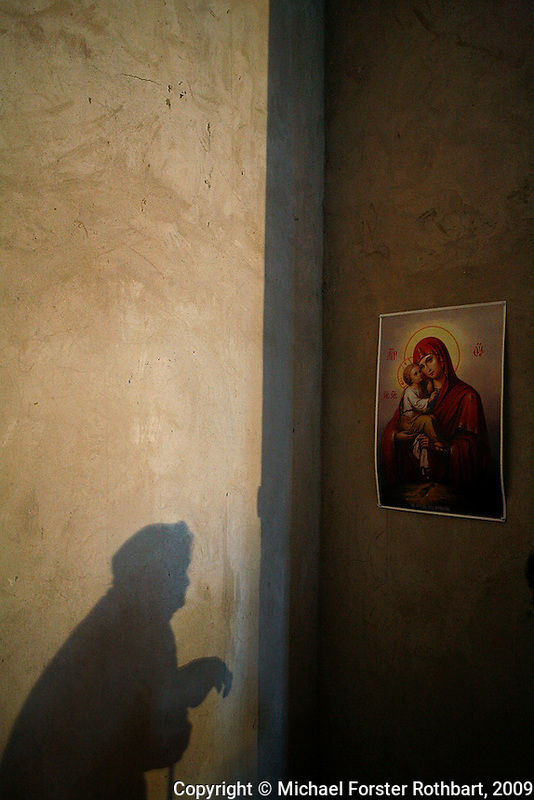 Original caption: .An elderly woman prays before a poster of Mary and Jesus while Father Momotyuk Nazarii leads a service at the small Ukrainian church in Novo Ladizhichi village. The church has been under construction for a full decade, as villagers have had trouble raising enough money to continue building. ..Novo Ladizhichi was built to house evacuees from the original village of Ladizhichi following the 1986 Chernobyl accident. It was constructed by the Soviet government in 1987 at the edge of Sukachi village. Because the church is unfinished, it is decorated with temporary posters rather than paintings..-------------------.